Just a little less than an hour to go before the telecast announcer says, "Welcome to the 52nd Super Bowl sponsored by FutureNet and FutureAdPro." After all Ryan did say that he acquired sponsorship of the Super Bowl for a mere $45,000 where 30 second ads cost $500,000. Hmm, he did say he was suffering from dementia and early stages of Alzheimer's. Must have been one of 'those' moments that made him think he bought sponsorship instead of a limited press pass for pre-game activities. I just realized that I was wrong on the cost of 30 second ad, it was $5 Million not $500,000 and a 1 minutes ad was $10 Million. And you can imagine how shocked, shocked I say, about the Super Bowl not announcing it was sponsored by FutureNet/FutureAdPro. Last edited by EagleOne; 02-04-2018 at 08:38 PM. "Yobit is no longer listed as an exchange partner on high-profile sites such as CoinMarketCap. Founded in Russia in 2015, Yobit is already in the headlines following problems with users trying to withdraw funds from wallets." shipdit, HARRISON and ribshaw like this. Oops...blockchain is blocked up already. Ryan says FuturoCoin is making 'serious progress'. He also says he's dying soon, which is also not true, unfortunately. Harrison, you have to look at the bright side. At least Keith will know who to blame for his loss, and it won't be us haters. shipdit, Della Cate, HARRISON and 1 others like this. Ryan said the FTO coin was skyrocketing. For one week, it did. Huge blocks of coins were being purchased in a small space of time to inflate the price. But now it's in freefall again, Futurenet can't sell their dodgy coins quick enough. Interesting take on the new data laws: Comply or we'll close your account! why..........they'll never overtake facebook at that rate. and they were soooooooooooooo close too. 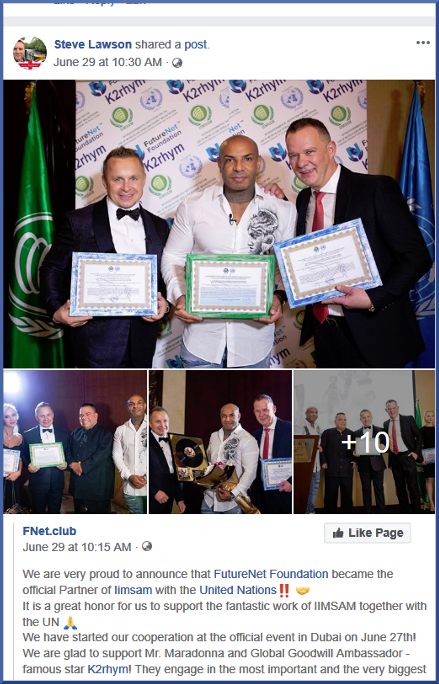 I also give my consent to receive from BCU Trading LLC of Abdulla Al Fahed-4 Office Number 210 Al Quasis second 96032 Dubai, company no.781893 which pursuant to art.27 of GDPR appointed a representation in the European Union, i.e a company of Coders House Spoika.z.o.o. of ul. Nowogrodzka 31,00-511 Warszawa business information via electronic means to a given email address pursuant to the Act of 18th July 2002 on Providing Services by Electronic Means (i.e Dz.U.) (the Journal of Laws of the Republic of Poland), section 1219 as as amended). The consent is given freely'. shipdit, Della Cate, ribshaw and 2 others like this. indeed stealing 'michael s holmes' picture like that! The Calculation System needs to be re-constructed! bigger pipes......hacking.........theft........dengue fever...........debilitating accident! lawson will have a cry. Soapboxmom, littleroundman, shipdit and 5 others like this. Tone Vays has called Futurenet out as Ponzi, and managed to keep a straight face whilst interviewing Stephan and sleazeball Ryan. Fab video! Futurenet have only gone and got themselves 100 ATM machines! Yep...just go into one of their cafes and you can get money out in bitcoin! AND they're licenced in the USA! Futurenet have claimed another scalp. Why don't these guys use google before they plaster their multi-million dollar cars with Ponzi Scam names? HERE WE GO! The beginning of the end! They're creating a Version 2! Due to the continually increasing number of FutureAdpro users, there might be some system overloads, and, consequently, delays in FAP calculations. We are still working on solving all the problems, which may last until Friday. Now we want to assure that our team of programmers is working on an entirely new, improved version of FutureAdpro 2.0, which will undoubtedly eliminate this type of issues. The premiere is coming soon! Soapboxmom, littleroundman, shipdit and 3 others like this. This is odd What's the point of saying a US dollar is a FN dollar?